Aerodynamics are the principles that allow aircraft to take-off and fly. 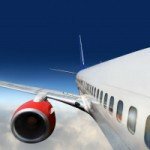 Understanding airplane aerodynamics and flight theory is essential for anyone involved in the aviation industry. Whether you are a pilot or aircraft maintenance technician, a strong knowledge of flight theory will help you understand flight safety issues and solutions. While airplane aerodynamics can be explained in basic terms, the principles behind it are quite complex. The base physics stem from Bernoulli’s principle and Newton’s three laws of motion. Contributing factors include the wing shape (airfoil), airplane size and weight, airplane power and velocity, and nature of the air. For a most basic understanding, the most important factors affecting flight are lift, weight, thrust, and drag. Lift is an aerodynamic force that results from an airplane’s motion through the air. As the air is cut and passes around the airplanes wing, a low-pressure system is formed above the wing, creating a vacuum. As the air rushing over the bottom of the wing creates a higher pressure than the top of the wing, the resulting force is lift. For an airplane to maintain a continuous altitude, the lift must equal the weight of the airplane. If the lift exceeds the weight, the airplane will climb. If the weight exceeds the lift, the airplane will descend. The forward motion of the airplane is called thrust, which begins with the airplane’s engine(s). The power from the engine is translated into thrust through the engines exhaust or a propeller. There is a resistive force of the air that causes the opposite motion, drag. As with lift and weight, the thrust must also exceed the drag for the airplane to maintain continuous speed. A part of understanding airplane aerodynamics is also knowing how the forces involved can be disturbed. What is popularly known as “turbulence” results from a variety of causes and takes different forms. Turbulence occurs where different air currents are brought together and cause disruptive conditions. This can be due to the mixing of warm and cold air currents, mountain range obstruction, changing wind directions, or erratic winds due to thunderstorms and other severe weather. In normal scenarios, the airplane will experience a slight bumpiness and/or tilting of the wings. While turbulence is not normally dangerous, there are certain situations that can pose a threat to the passengers and crew. With severe weather, the airplane can experience structural stress and damage. The FAA has regulations ensuring that airplanes are built to withstand intense aerodynamic forces, so the weather would have to be extremely powerful. If the turbulence occurs at low altitudes, pilots have to be aware of wind direction and altitude loss. At higher altitudes, pilots can change their heading or altitude to avoid serious turbulence. In this case, good communications with air traffic and navigation controllers is paramount for maintaining flight safety. In all cases, the pilot has to be aware of the dangers due to turbulence. If you have flown as a passenger on an airline, you will no doubt have heard the pilot ask you to keep your seat belt fastened while in your seat. Sometimes turbulence is unexpected and can be quite abrupt. There have been several cases where passengers and flight attendants have been injured during abrupt encounters with turbulence. For more information and updates regarding airplane aerodynamics - Subscribe to our free Newsletter.